In Part 1, I stressed that a consistent canopy of street trees is essential to the environmental and aesthetic quality of an urban residential neighborhood. 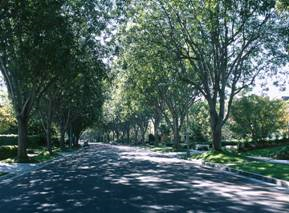 The pictures of a street in Beverly Hills, California (Fig. 1) and a street median in Savannah, Georgia (Fig. 2) illustrate how much a grand, well-maintained tree canopy can contribute to the beauty of a city. In selecting new species for the Fan’s empty tree wells, I listed several species that do not provide a good canopy and should be avoided. These included the Bradford pear tree, gingko, and sugar maple. Ordinarily, the sugar maple is a desirable street tree, but Richmond is out of their natural range. Lack of sufficient water and constricted tree wells prevent most of the Fan’s sugar maples from reaching adequate maturity and becoming good canopy trees. 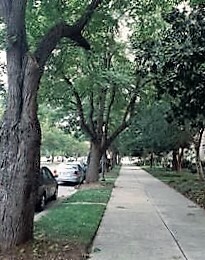 The majority of the Fan’s street trees are sugar maples, many of them in very poor condition. One of the most durable species for an urban setting is the willow oak, a native of this region. 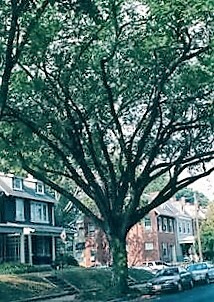 Willow oaks can thrive in the most stressful conditions and attain great height, making them ideal for a Southern city street canopy. 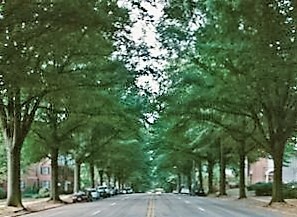 Most of downtown Richmond’s street trees are willow oaks, planted more than twenty-five years ago, and are flourishing. A number of the huge old willow oaks on Broad Street just north of the Fan District have no obvious water source; their trunks completely fill their tree wells, yet they are healthy. 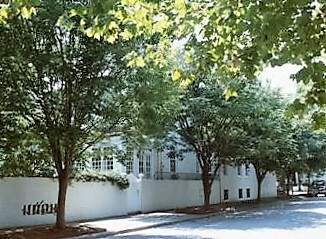 A striking colonnade of willow oaks lines the block of Malvern Avenue between Grove and West Cary Street, creating an impressive canopy (Fig. 3). We have nothing comparable in the Fan. A tree that shows much promise for fast growth and durability is the London plane tree, a disease-resistant version of the American sycamore. 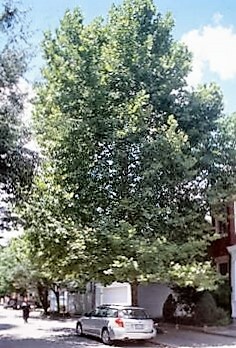 A plane tree was planted in front of my house on Granby Street nine years ago and already is towering well above the house (Fig. 4). The streets of many European cities are lined with plane trees. Many of the Fan’s streets originally were planted with American elms, some before the houses were built. Dutch elm disease has killed most of them. Fortunately, blight-resistant American elms have been developed in recent decades. These include the Liberty elm, and the Princeton elm, both of which are approved for planting as street trees. The city has planted a scattering of blight-resistant elms on streets in both the Fan and the Museum District. More should be encouraged. With their fountain shape there is no more beautiful tree. The American elm in the Museum District shown in figure 5 regrettably has succumbed to disease, but it offers us an image of how blight-resistant American elms can provide a spreading canopy (Fig. 5). Because the Fan’s plethora of overhead wires, trees in proximity to wires cannot be allowed to interfere with the lines. Hence, the city does not permit tall, fast-growing trees near overhead wires. A smaller, slower-growing species of elm, the Chinese elm, can be an acceptable alternative for a tree well near overhead wires. 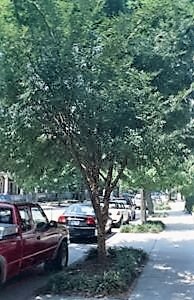 Shown is an example of a Chinese elm on Grove Avenue (Fig. 6). I had a Chinese elm planted in front of my house last spring. Another tree with a good record for survival as a Richmond street tree is the linden, mainly the little-leaf linden. The Boulevard is a well-known example of a major American street completely lined with linden trees (Fig. 7). Our native linden trees are durable and relatively slow growing. They eventually will achieve sufficient height to offer a decent canopy, particularly on some of the neighborhood’s narrower street. The Fan District has experienced good results with the many red maples (Fig. 8) and zelkovas (Fig. 9) planted in recent years to replace dead sugar maples and American elms. Unlike sugar maples, red maples are native to the region and are happy as street trees. Zelkovas are in the elm family and are native to Japan and Korea, and are blight resistant. However, zelkovas need to have their limbs thinned to prevent them from becoming overly dense. Red maples should be limbed up to encourage making a canopy. We don’t want to discourage continued use of red maples and zelkovas, but we need to caution against the neighborhood becoming too much of a monoculture. A compatible variety of species is the best way to guarantee the maintenance of a tree canopy. The following is a partial list of tree species approved by the city for planting in the Fan District’s streets. Of course, each new tree species on city property must be approved by the city arborist. See the city’s Public Works - Urban Forestry website to learn more about the general Adopt-a-Tree program and tree approval.